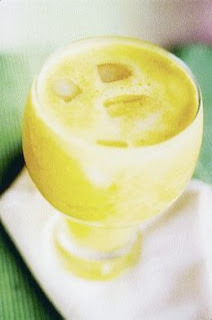 Here's a simple to make, low-cal and healthy mocktail recipe with BANANA - our fruit of the week! Peel the banana and cut into thick slices. Peel the oranges and discard the seeds. Put the banana, oranges and some water into a juicer and blend until fine. Pour the mixture into a glass. Stir in sugar syrup to taste. Add a little more water to form a more fluid consistency. Add some crushed ice to help to reduce bubbles and also to prevent the ingredients from oxidation and changing colour.